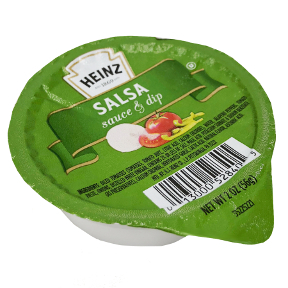 2 oz Salsa Sauce & Dip Cup. Take you salsa on the go with this convenient size cup. Ingredients: Diced Tomatoes (Tomatoes, Tomato Juice, Citric Acid Calcium Chloride), Water, Jalapeno Peppers, Tomato Paste, Onions, Distilled White Vinegar, Contains 2% or less of Salt, Malic Acid, Potassium Sorbate and Sodium Benzoate (as Preservatives), Calcium Chloride, Dehydrated Garlic, Lactic Acid, Natural Flavor, Ascorbic Acid.